A.D.Deertz is all about making laid-back, unpretentious, timeless, quality products. In her own words: “I want to make clothes that look like the guy who wears them had them for years – and they’re his favorite things.” Deertz no longer binds her collections to quarterly seasons and instead focuses on perfecting her classics. This also means that new designs are created at a healthy tempo, without the need to be rushed in for the next sale cycle. Each article is made in a small series. The number of pieces is usually determined by the amount of fine fabric acquired on location during one of Deertz’s expeditions. Deertz spends months in every new location – carefully choosing materials, adopting local manufacturing methods, all the while exchanging skills, and collaborating with regional professionals. While staying in Argentina, she worked with a Bolivian indigenous family that was living illegally in Buenos Aires. In Bangkok she joined forces with a second-generation fabric trading and production company run by an Indian family. The people that Deertz meets and the stories that she collects along the way are the fuel for inspiration and infuse her work with that something so uniquely hers. 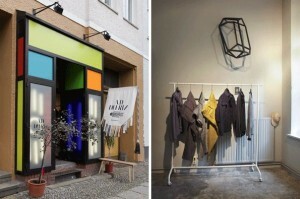 The A.D.Deertz store is located in the Mitte District of Berlin and is currently the exclusive outlet for the label. Tags: a.d. deertz, addeertz, addeertz.com, berlin, copy, designer, fashion promo, menswear, press release, Promo, quality clothing, torstr.